Successfully Added HK Warehouse Oukitel K6000 Plus Android Phone - Android 7.0, Octa-Core CPU, 4GB RAM, 1080p, 6080mAh, Dual-IMEI, OTG to your Shopping Cart. The Oukitel K6000 Plus is an exceptionally powerful yet affordable Android phone. It comes packed with a whopping 6080mAh battery. This cell provides you with up to 16 hours of continuous usage time. Thanks to this, you’ll have enough juice to get through multiple days of regular smartphone usage. With its massive storage capabilities that include 64GB internal memory and a 128GB SD card slot, you have all the needed space to keep your files and media. With this Android phone at your side, you’ll never have to experience a moment of boredom again. Besides it powerful battery, this Android phone packs an Octa-Core processor. This CPU has been clocked at 1.5GHz and comes together with 4GB RAM. Together, the hardware treats you to an outstanding performance. No matter what you throw at this little beauty, the Oukitel K6000 Plus is sure to handle it without dropping a frame. With access to the Play Store, you can easily download free movies, Apps, and games. All your favorite media can be enjoyed in stunning 1080p resolutions on the phone’s 5.5-Inch Full-HD display. This means that you’ll always be treated to stunning visuals while using your latest Android phone. The Android smartphone comes with two SIM card slots and Dual-IMEI numbers. Thanks to this, your cell phone lets you stay connected to two network providers at the same time. This makes the phone perfect for separating work and private life in one device. Along with 4G, you’ll be treated to great connectivity wherever you are. Whether you like to make calls or browse the web – this Android phone will always keep you connected. Along with Android 7.0, your smartphone is sure to treat you to a smooth user experience no matter your mobile demands. 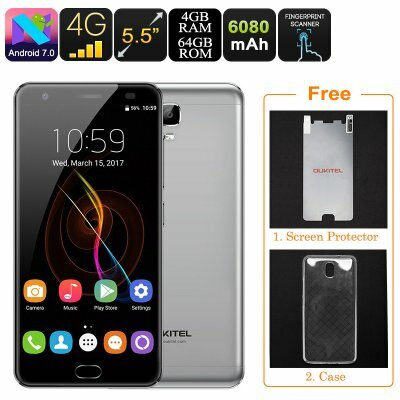 The Oukitel K6000 Plus smartphone comes with a 12 months warranty, brought to you by the leader in electronic devices as well as wholesale Android phones.. Product is working great. I can recommend chinavasion and the product. Took long untill payment was confirmed and product sent. But once sent, super fast delivery.